Sometimes inspiration for patterns comes in unexpected places. A month ago, I was having one of those days where all you want to do is lay on the couch and veg out. I downloaded a relatively new mobile game for my iPhone called Alphabears. It's a pretty standard word-building game, with one adorable difference: cute blocky bears in costumes. 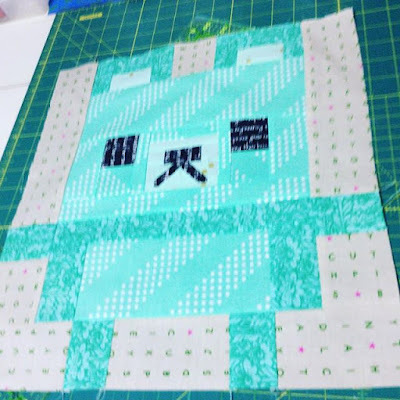 After playing a few rounds, the light bulb switched on and I ran to my computer to design a teddy bear quilt block. Once I had the block design nailed down, I started working on a quilt layout. Then, as I shifted a second block over, I realized the teddy bears would "hold hands" without sashing strips between them. It was just too cute to pass up. 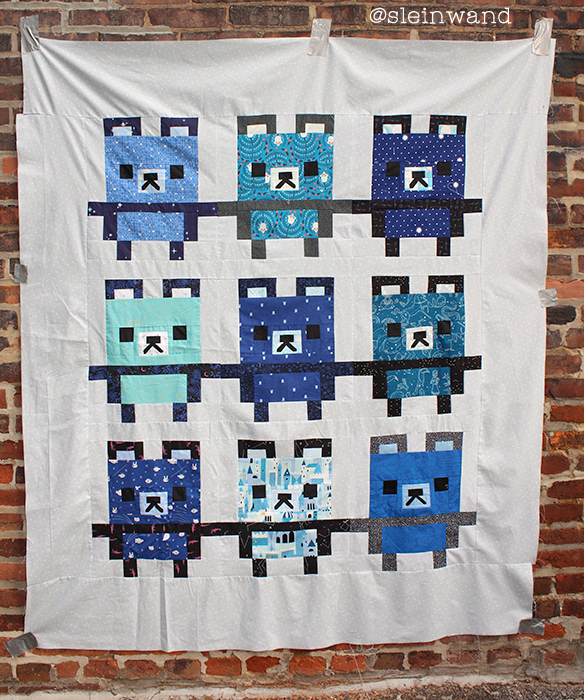 The Teddies Quilt patterns consists of nine teddy blocks, each comprised of three fabric prints plus a black solid (or near solid) for the eyes, nose, and mouth. My pattern provides material requirements for three bears in each of three colors, as well as cutting instructions for individual teddy blocks if you want to make scrappy teddies like some of my testers. @applepiepatchwork made her charming teddies with Bonnie & Camille scraps. @gailtmonroe used her teddies' bellies as a clever opportunity for fussy cutting, which reminds me of Teletubbies. 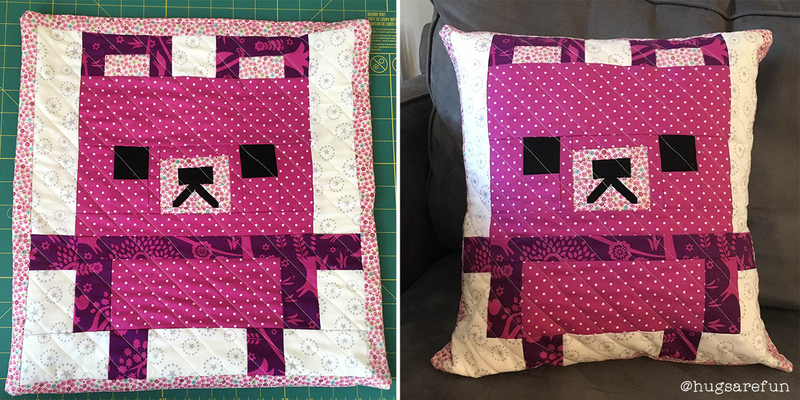 @hugsarefun made her magenta teddy into a huggable pillow. @3stitchin_nite_owls also made scrappy teddies with Alison Glass prints. 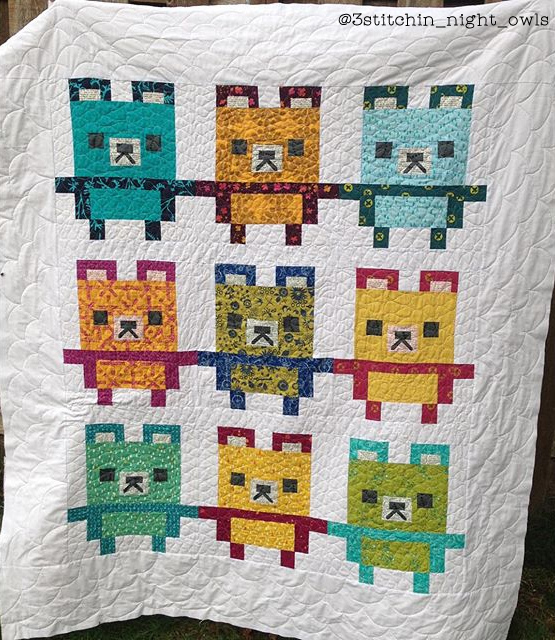 @Ifitaintkate didn't have time to finish the quilt top, but she did make some adorable bear-ception blocks with Cotton + Steel prints. @sleinwand is after my heart with these blue teddies! How cute is that Castle Peeps teddy?! 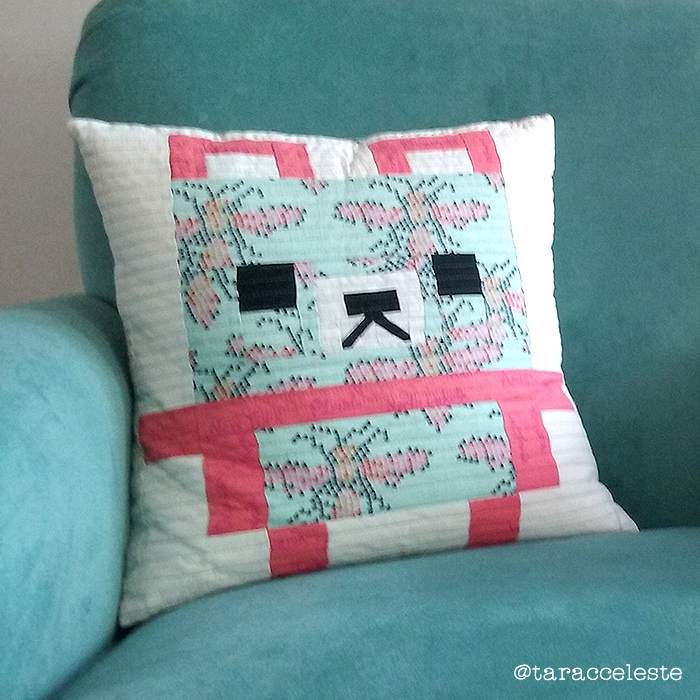 @taracceleste also made her teddy block into a pillow! @karriofberries made a turquoise teddy that she plans to finish into a tote bag. Won't that be cute? Thank you to my testers for all your work! They really made these teddies come to life. 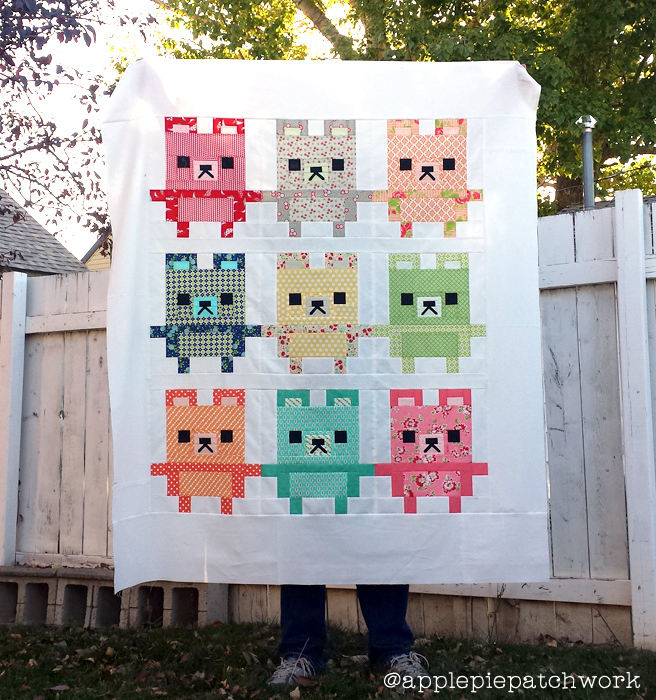 Click *HERE* to purchase the Teddies Quilt in my Craftsy shop. Check out the hashtag #TeddiesQuilt on Instagram to see more teddies! Love this bear pattern! Great versions produced by the testers too. 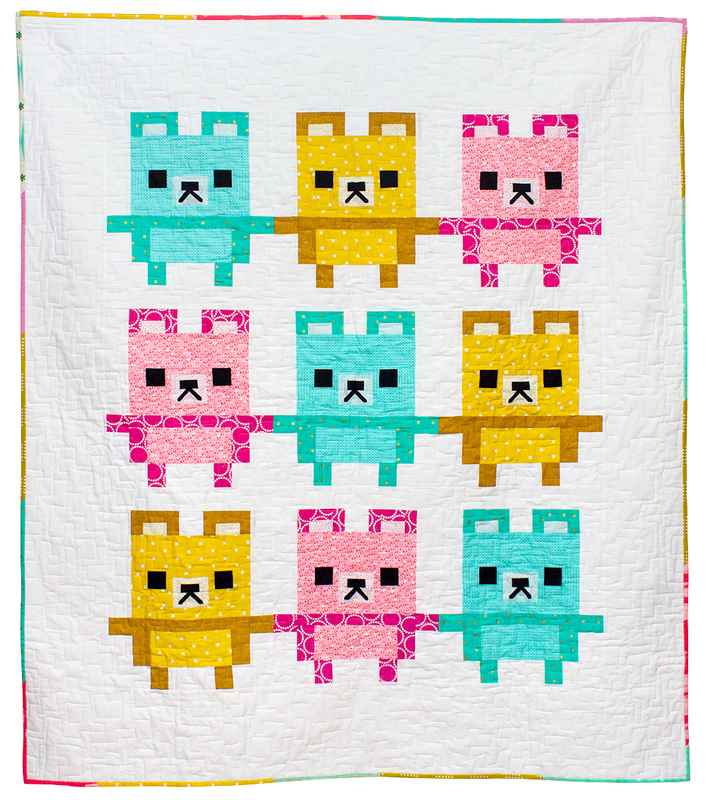 Oh my gosh, I was surfing instagram the other day and my daughter saw this quilt. She immediately said it was the Alphabears, but I told her it wasn't, it was just similar. I guess I was wrong! !